from Martha Stewart’s Cookies, p. 68. First, biscotti, now cookies. Sherry has inspired me to keep moving in a bakerly direction. I have learned from her that cookie-making is an art, not side-line to serious cooking. For instance, she maintains that no people understand cookies as well as the Italians. Perhaps when I post this, she’ll add a comment to explain what she means. In the meantime, about a week ago, she brought over a few chocolate cookies with snow-capped surfaces that I went wild over. I am beginning to understand how satisfying a good cookie can be. They’re small, discrete, and, ideally, well-balanced between sweetness, moisture, and texture. Among her favorite cookie books, Martha Stewart’s new book on the subject holds a very prominent place. It is easy to sneer at Martha Stewart — at least I used to find it easy. But now that I’ve tried a number of recipes from her books, she has earned my respect. I’ve skimmed through the new book of Martha Stewart’s Living recipes (seen at Costco in this season) and noticed quite a few recipes I’d like to try, including a number of interesting biscotti recipes. Her compendium of hors-d’oeuvres is very useful. I don’t often use it, but I’d never get rid of it. In fact, she has a recipe for a savory biscotti (browned-butter, lemon and capers) that I will attempt soon. 1. Melt chocolate in a heatproof bowl set over a pan of simmering water, stirring. Set aside and let cool. Sift together flour, cocoa powder, baking powder, and salt in a bowl. 2. With an electric mixer, beat butter and brown sugar on medium speed until pale and fluffy, 2 to 3 minutes. Mix in eggs and vanilla, and then the melted chocolate. Reduce speed to low; mix in flour mixture in two batches, alternating with the milk. Divide dough into four equal pieces. Wrap each in plastic; refrigerate until firm, about 2 hours. 3. Preheat oven to 350. Divide each piece into sixteen 1-inch balls. Roll in granulated sugar to coat, then in confectioner’s sugar to coat. Space 2 inches apart on baking sheets lined with parchment paper. 4. Bake until surfaces crack, about 14 minutes, rotating sheets halfway through. Let cool on sheets on wire racks. 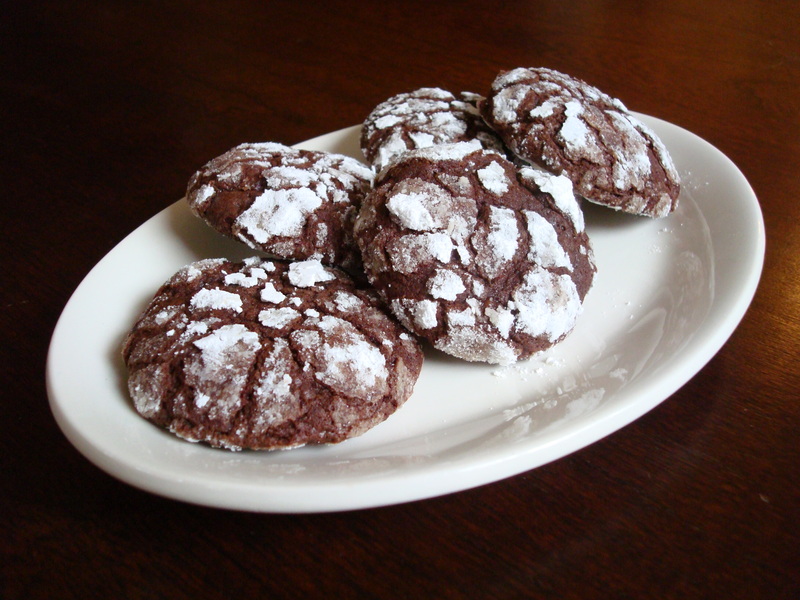 Cookies can be stored between layers of parchment in airtight containers at room temperature up to 3 days. First, only Valrhona chocolate will do. I used Dagoba’s cocoa powder. None of the cocoa powders I saw in my favorite fancy-shmancy market identified themselves as “Dutch process,” so I had to let that go. I set a clear Pyrex bowl over a saucepan of water to melt the chocolate and then set it aside. A hand-held electric mixer might work in a pinch, but this recipe really requires the heft and endurance of a counter-top electric mixer. However, the butter and brown sugar never got pale and fluffy. So, I let that go as well and forged on. Dividing the flour into two additions allows for the smooth intergration of the dry ingredients. I found I had to stop the mixer a few times to scrap down the sides, because too much was adhering high up the side of the bowl. Because of all the bread and biscotti I’ve been making, I was expecting a much more solid “dough” than what the recipe produced. The consistency resembled very thick frosting. It certainly was wetter than I expected, so I wasn’t sure how to divide the dough into four portions. So, instead, I transferred the entirety to a bowl, covered it with plastic wrap and stuck it in the fridge. The first rolling in granulated sugar is easy. The trick to the second in confectioner’s sugar is to make sure the sugar sticks to the balls at least in patches all over the surface of the ball. The baking time was perfect. The cooling on the rack is what makes the surface of the cookie a touch crisp and the inside continue to be chewy. If you prefer to keep some on hand, Sherry says they freeze well. I am going to confront the wet dough and divide it into four. It will make for uniform sizes better than I managed by eyeballing the amount between my fingers. I love most Italian cookies because they are not too sweet, or too heavy, tend to be crumbly, and usually contain some sort of nuts. They are perfect for those times when I want a bit of sweet most, like with coffee in the afternoon or finishing up my wine after dinner.